Though many investors will devote a majority of their time, and budget, to tangible areas of their business, there is an often under-utilized (and more profitable) part of their business that gets overlooked: the investor’s real estate referral network. Unfortunately, what many investors don’t realize is that handing out a thousand business cards at any number of real estate investing clubs or barraging folks with spammy real estate social networking ads is not the best policy to build a real estate network. A far better policy is to go where the “fish are already biting,” and see what you can do to help others, as much as discovering how other people can help you. But where do you find these potential members of your real estate referral network? Well, here are five great places to find folks to add to your real estate network, and tips for how to make the most of your networking time. If you want to find serious real estate buyers and super-charge your real estate network in no time, there may be no better place to start than a real estate auction. For one, these are like-minded individuals, who are in the same industry and run in the same circles as you do. Secondly, by introducing yourself to investors and letting them know how you might be able to help them, you’ll stand out in a crowded (often cutthroat) environment. If you haven’t joined your local Real Estate Investor Association (REIA) yet, you’ve got some instant homework. Both REIA meetings and Landlord Association meetings can be the perfect entrée into the business and a fantastic way to meet professionals related to your craft (especially for beginners just getting started). As with all aspects of networking, leave the “hard sell” at home, and ask people what their area of expertise is, and what types of investment properties they prefer to invest in. Be sure to let them know, if you find something in their sweet spot, you’ll keep them posted (it’ll make you the “king of networking” in no time). While most larger cities will have their own REIA or Landlord Association, some smaller cities or towns don’t. Worry not, all you have to do is create your own REIA chapter. Not only will you get to set the agenda, but other members will view as you a valued, local resource. Where else can you find local business leaders, and the most motivated entrepreneurs in your market, all under one roof? With their weekly lunches, your local Chamber of Commerce is a great way to “hob-nob” with the business movers-and-shakers in your area. Just contact them to see if they have any lunches coming up, and if they’ve got space at their table for a friendly, neighborhood real estate investor. Don’t worry, when they find out you’re an investor, everyone will want to sit next to you. Not only will you meet typical brick-and-mortar business owners, but you’ll have a good chance of meeting with professionals in the finance and legal sectors; those folks are a great pipeline to private investors. And who knows: If you spend some time getting to know people in the organization, and pay your dues, you might be asked to present to other business notables on the topic of real estate investing — great way to build rapport, and generate leads, without breaking a sweat. From contractors and lenders to investors and building suppliers, home and trade shows are a great way to get in front of the people who make the housing industry go, and gain valuable intel on how the housing market is “really” doing. 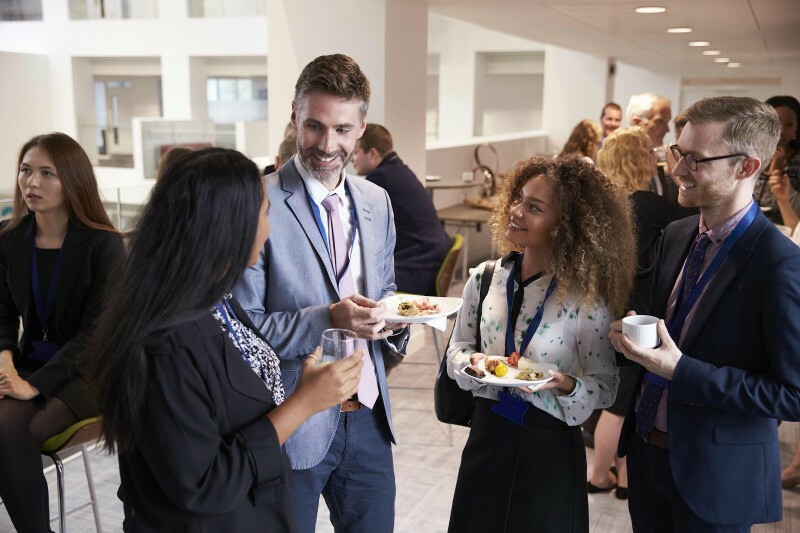 Now, like any other networking or conference setting, one can get lost in a sea of exhibitors and booths and miss the goal of attending these types of shows. It’s important that you have a clear, articulate strategy for what you hope to accomplish from attending this type of show; perhaps you could make goals of how many people you want to meet. Better yet, to put your real estate networking on overdrive, you could rent a booth at the trade show. This can put you in front of thousands of people over the course of a few days. Just be sure your booth has some visual pop to it, so as to attract attendees. Otherwise you’ll be spending your day sitting at an empty booth. Social media is a double-edged sword. On the one hand, it’s a great platform to connect and engage with the types of people you want to add to your real estate referral network. Some platforms, such as Facebook, have extensive targeting which let you reach the exact person who’s your ideal member of your network. On the other hand, social media can also be a waste of valuable resources, if not approached with a clear strategy. Not to mention the fact people can be put off by overt sales pitches. Whether you spend a majority of your time on social media platforms such as Facebook, LinkedIn, or Twitter, always ask yourself one thing: “What value can I bring these people?” Whether it’s how-to advice or simple kudos for a job well done, always contemplate how you can elevate other people. You’ll find your real estate networking takes off as a result. Building a robust real estate referral network isn’t rocket science; it’s about meeting as many different types of people as you can, articulating exactly what you do, and emphasizing how you can help people get what they want. If you’re able to do that, in about sixty seconds or less, you’ll find your real estate networking efforts — no matter how or when you execute them — don’t require as much effort as you thought.